Click the box to get to the interview of Bobby "G" Gleason. 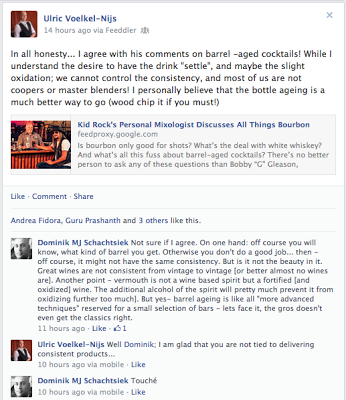 Yesterday, I have read on Facebook a link of Ulric, in which the master mixologist of Jim Beam [I didn't fully understood, why he was called the personal mixologist of Kid Rock, but this is a whole different story] gave his opinion about cocktail trends. In this piece, he mentioned that he doesn't like barrel aging cocktails, due to the inconsistency [different barrels with different origins and so on]. See link below. Ulric agreed on this - while I wrote a counter-comment, that sometimes consistency is not everything. Deservedly I got punished by a sarcastic comment by Ulric, that I don't like to deliver consistent cocktails in the bar - I only replied "Touché" - as I had in mind to write this piece here. What i meant [and partly also mentioned] was, that consistency is important. But it is not everything! Especially not in a very good bar. Stop! Don't you think to leave this place and talk around, that I don't vouch for consistency! I mean that the consistency in taste is not everything! Consistency in quality is critical! I also mentioned the examples of great wines [which are not consistent in their vintages] or you could also add the concept of single barrel spirits. And lets face it, even big brands of barrel aged distillates have their products fluctuating; not by a lot. But otherwise, why would the same tasting panels rate diverse whisk(e)y, cognac, rum, tequila brands differently every year? Because even if it is "large batches" there are small differences in the end result. Barrel aged products are not 100% taste consistent. Should we now discontinue [to buy / to produce] barrel aged distillates and wood-chip age everything? Definitely not. Should we stop to buy and offer small batch, single barrel [or cask] products? Hell no! To make a barrel aged cocktail, you definitely need to know the exact specifications of the barrel. Is it an used barrel or is it new? What liquor/wine was in there before? How big is the barrel? How much is the charr [or is it only toasted?] - is it re-charred after it was used? All of these variables will have an ample impact into the aging results [taste, speed of aging, intensity of the oak impact]. If you have barrels made out of bourbon wood, you are lucky. Bourbon [and the other straight whiskeys from the US] is aged in heavily charred oak barrels. Recharring them would definitely have an impact into the product, however would not be so important. Specially produced barrels might be different. And you might be more carefully. Cognac, wine or fortified wine barrels [sherry, madeira etc] are very seldom used in the bar, due to their overall size [due to micro / craft distilleries in the US, small bourbon barrels became available. However barrels from other origins are usually much bigger than 200 liter - hence they are not used to oak age spirits in a bar. Fortified wine barrels [or barrels made out of the staves of sherry / port / madeira barrels] would have quite a high impact into your cocktail. They would release more color and usually dried fruit notes are amplified. Only problem will be, that you will hardly get these barrels. Smaller barrels impart a heck more contact to the wood of the spirit as large barrels. They amplify the aging [however the result might be more robust and less complex]. If a normal bourbon barrels would need more than 2 years to have an adequate impact in the liquor inside, an one gallon barrel will shorten the aging time to merely months. Off course, this comes at a cost - but you might not have the choice [time & resource constraints…]. Practical step: priming the barrel. This is basic. Now - if your barrel is a fresh [untoasted, or toasted but uncharred wood], you might want to charr it. This might be a bit more complicated. But applying fire to the inside of the barrel might result into a much better result [you might want to charr the barrel before you soak the barrel]. For spirits, not the raw wood, have the "magic" impact, but the charr in the barrel. The heat results into the breakdown of the "wooden cellulose" which results then into vanilla-like compounds as well as imparting a typical sweetness. It also prevents the liquor to absorb tannins [you don't really would like to get an astringent cocktail, do you?]. After priming the barrel you could leave it for another couple of days drying up, and then adding wine/fortified wine to it and let the wood soak up again. This would give you a semi-fortified_wine [sherry/port/madeira] finish. After that, you would add the cocktail. But the pain is not yet over… you have to test [taste] regularly, to make sure, that your potion doesn't "over-oak". While you want to have oak-age influences in your drink, you don't want, that it taste like oak! After the concoction reaches the perfect "oak-maturity", it also has to be removed from the barrel. Best would be, to store it in glass bottles or growlers [and if you have a really big barrel, you could use glass demijohns]. Jamie Boudreau is suggesting, that you leave always a bit in the oak barrel, to see, if the liquid ages even positively ages further - I am not so sure about it, as I see the potential, to recondition you barrel and directly refill it with something else! Are your barrel aged cocktail consistent? No. Every batch you will make will be different - depending on your choices and on the barrel, it will be ever so slightly different or will have a huge variance to the previous one. But again - we are not talking about one cocktail at a time! We are talking about batches. If you work in a bar, which will sell hundreds of oak aged cocktail a month, you will increase the barrel size massively [maybe even use more than one barrel - so you can blend the results] to keep up with the demand. That means, you have again consistency - even if it is only for one batch. Small oak barrels are available from 1 liter to 4 gallons [which is 15 liters] up to 10 gallons and more. Hence - are you really inconsistent, if you are doing batches of oak aged cocktails, Mr. Ulric? Obviously that means, that you won't pour directly out of a barrel into your stirring glass, as I have seen it several times. Barrel aging has less to do with showmanship and more with actual taste results. Bartender should though understand the nature and the techniques of barrel aging!